Here it is folks. The last day of our Central Coast Tour trip during Spring Break 2009. We tend to pack in just enough fun to wear ourselves out completely. So we were all a bit tired, but still enjoying our vacation, on this last day. We spent the morning packing and cleaning up before we finally headed out for the last time. We wanted to visit this Mexican/California fusion restaurant that my parents found the last time they were at the coast. They told us stories of burritos that were the size of your head - so of course they had our interest peaked. We had to see this place (and the burrito) for ourselves. It's called Taco Temple in Morro Bay. Check out this food! Boy did they deliver! 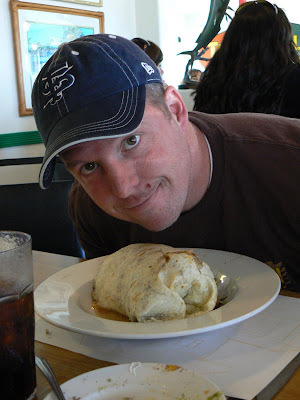 That burrito of Jeremy's was just about the size of his head. Trevor's $2.50 tostada was huge! My albondigas soup had meatballs the size of my fist and my parent's full size tostada could have been a meal for our ENTIRE FAMILY. This is why we Californian's have a need for portion control. The servings were absolutely huge, beautifully presented and surprisingly different than regular Mexican food. The meat was seasoned with non-traditional Mexican food spices and they served only black beans - not refried. Their lettuce was not shredded iceberg, but fresh spring mix. It was a taste adventure for sure! We said good-bye to my parents after lunch and then headed to the Shell Shop in Morro Bay. The kids spent 45 mintues picking their souveniers before we made our way over to the beach. We pulled up and the kids almost did not want to get out of the car again. It's hard work having so much fun! We got out and climbed down to the beach. The tide was out so there was some good play area - perfect for a game of catch. Jeremy had fun teaching Lizzie how to throw a ball. I was impressed by Trevor and Logan's skill. They could both throw and catch the ball really well. A couple of last photos before we hopped back into the car for the drive home. Well, we did it. We wiped him out good. The kids thought Jackson's sleeping position in the car was pretty funny. And I have to say that his nap made our ride home so very enjoyable. One last thank you to Kelly and Julio for a great vacation. Your home was warm and welcoming and we hope to return the favor soon. But for now, Spring Break has come to an end and life will go back to normal tomorrow. It was great to spend so much time together and it's amazing how one week is never long enough. What a nice trip. Too bad the break had to end. I am SO jealous...I love that place...we are totally going to have to go now that I see all these fun pictures...and that food looks to die for...yum! You'll have to give us directions when we go! Looks like you guys had a great time, so fun to see such happy, family pictures!